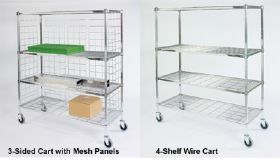 Wire carts have square tubing posts that provide extra rigidity. 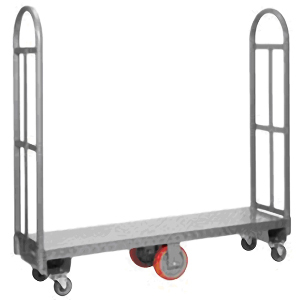 5" non-marking swivel casters.&nbsp;Shelves are adjustable in 2" increments.&nbsp;FOB Shipping Point. 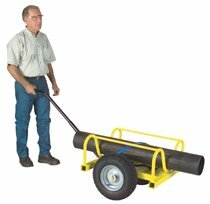 Safely store and transport pipes, bars, and other long, awkward items.&nbsp; Structural channel uprights with 1 1/2" square tube arms have 4 1/2"H.&nbsp;stops on ends for load retention.&nbsp; 12 ga. steel lower deck stores and transports smaller parts, packages and more.&nbsp; Handles 3600 lbs. overall, 2000lbs. 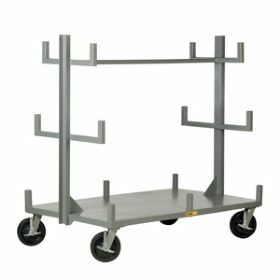 per level evenly distributed.&nbsp; Polled on 4 swivel casters for maneuverability with 8" x 2" phenolic wheels for ease of movement.&nbsp; Horizontal storage space, each side - top is 7 1/2" middle is 11" and bottom is 15".&nbsp; 11" platform height.&nbsp; 58" overall height.&nbsp; FOB Shipping Point. 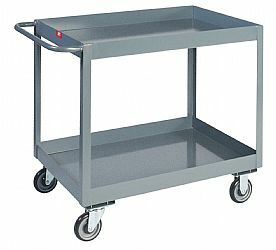 Designed for safe, efficient handling of round or rectangular tables. 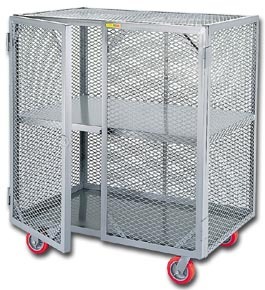 Tubular frame design has cross bracing and channel caster mounts. 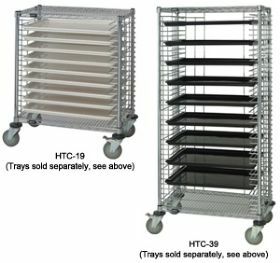 Folding tables are protected from scratching with solid, high density polymer bolt-on protector strips. Handles made of 1 5/16" diameter round tubing. 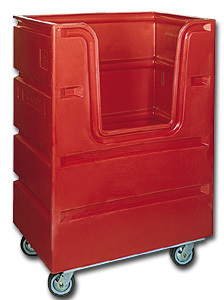 Round folding table truck will edge stack 6-8 tables, 48" to 72" in diameter. 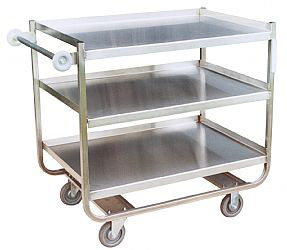 Rectangular folding table truck will flat stack 10-12 tables, 48" to 84" in length. 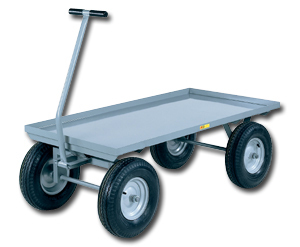 Easy maneuverability in congested areas with non-marking 5" wheels, 2 rigid, 2 swivel. 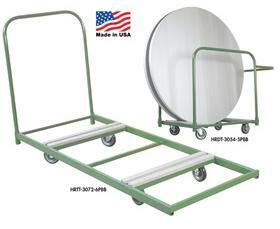 Green epoxy powder coated finish for durability. Shipped KD. FOB Shipping Point. Rugged 5500 lb. capacity. Spring-A-Matic handle self returns. 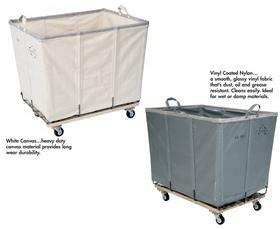 Safety designed loop handle includes neutral position and fingertip release. Three position hand lowering control. One piece formed steel "C" channel tapered, reinforced forks. Leak-proof pump. Hard chrome plated ram and piston. 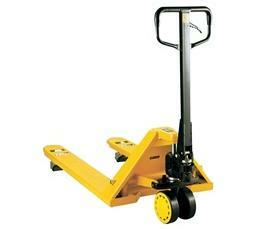 Tapered fork end and pallet entry rollers. 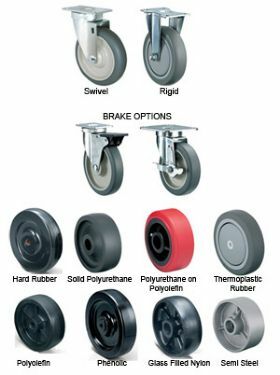 Polyurethane wheels and rollers&nbsp;for a quiet and smooth use. 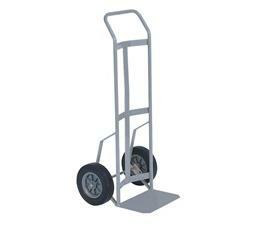 Model# HEZ27x48EZVS/W is our steel wheel pallet jack. 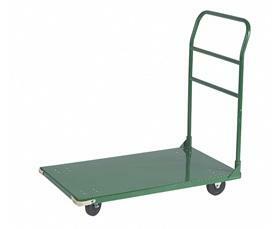 This unit has steel steer and load wheels.&nbsp;FOB Shipping Point. 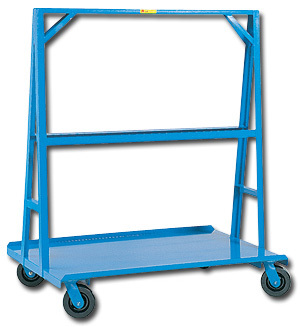 Frame extends 48" above deck with uprights 12" apart at the base. 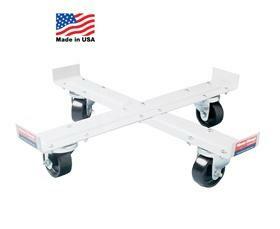 Easy rolling on 4 - 6" swivel phenolic casters -- 2000 lb. cap. FOB Shipping Point.